The medieval comedy adventure will slay Blu-ray this August. In an early announcement to retailers, Universal Studios is working on 'Your Highness' for a Blu-ray release on August 9. 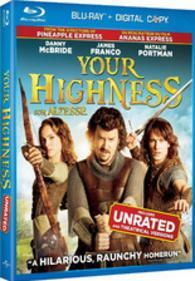 Get high and mighty with Danny McBride, James Franco, and Natalie Portman in 'Your Highness' -- the epic and hilarious action-comedy from the director of 'Pineapple Express.' Two royal princes—slacker Thadeous (McBride) and the noble Fabious (Franco)—join with an elusive warrior (Portman) on a quest to free a princess from an evil wizard. Along the way they’ll have to vanquish horrific creatures and traitorous knights in this raunchy trip loaded with footage too outrageous for theaters. The Blu-ray will include both the theatrical (103 minutes) and unrated (106 minutes) cuts of the film in 1080p video, a DTS-HD Master Audio 5.1 soundtrack, and supplements include: Audio commentary with video intro from Director Gordon Green, Executive Producer/Co-Writer/Star Danny McBride, and Stars James Franco & Justin Theroux; Damn You Gods: Full-length "making of" documentary; Alternate scenes; Gag reel; Line-O-Rama; Perverted Visions; A Vision of Leezar; My Scenes; and Pocket Blu. You can find the latest specs for 'Your Highness' linked from our Blu-ray Release Schedule, where it's indexed under August 9.